Home / Our Blog / There’s Much More to Pool Noodles! Who Knew?! There’s Much More to Pool Noodles! Who Knew?! Pool noodles are cheap and have many more uses than just floating in the water. Here are some creative pool noodle hacks to help keep kids busy this summer. using a rope or stack them to build a tower. Work on creating patterns using 2 or 3 colors or different shaped pool noodle pieces. Write letters on the pieces and have your child arrange them to spell his/her name, sequence the alphabet or create sight words. Write numbers on the pieces to help with number identification and sequencing numbers. These are great ways to strengthen hand-eye coordination and build pre-math & literacy skills (e.g. letter/number identification, letter/number sequencing, name identification, patterning: AB, AAB, ABB, ABC). 2. 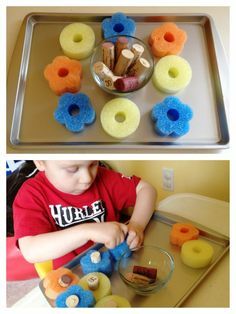 Have your child put rubber bands around the pool noodles or push corks into the middle of them. This activity will help strengthen your child’s hand muscles and improve their dexterity. 3. Use pool noodles to bounce balloons around - we all know how much fun kids have with balloons, and this takes it to a whole new level! Put some noodles on the ground to use as a balance beam or add a sturdy board on top to create a balance board. Make a fun obstacle course by securing noodles into the ground using chopsticks or wooden dowels that kids can then crawl, jump or kick a ball through. 4. Trim the bottom of a pool noodle so it can sit flat and add a slit on top to hold game cards, picture choices or step-by-step picture instructions. 5. Pool noodles can be used around the house, too! Use noodles as a door stopper or put them underneath a fitted sheet to keep children from rolling off the bed. 6. And our last hack is to help Mommy and Daddy enjoy summertime even more. 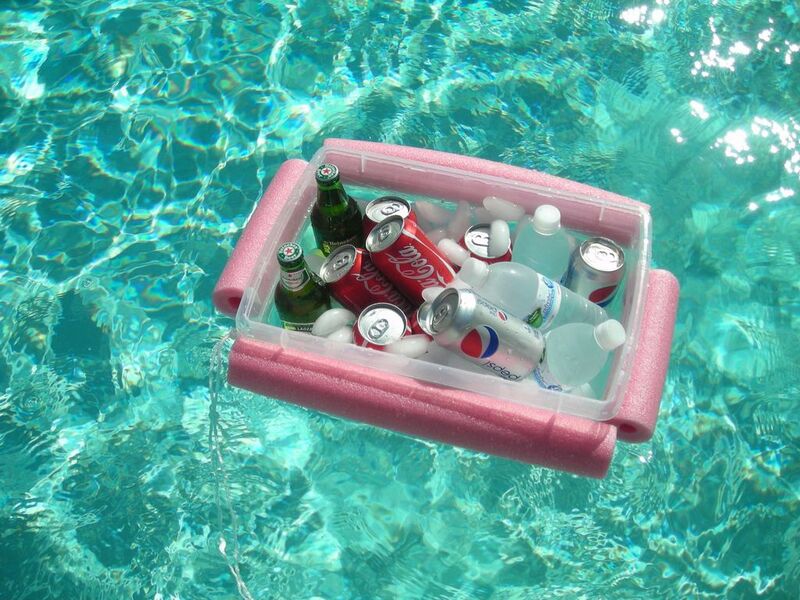 String pieces of pool noodles around a plastic bin filled with ice and your favorite beverages and, voila...a floating cooler! Thank you Kristen and Julie for your kind words!